Rae White is a feminist, community radio presenter and activist from Brisbane. Rae joined 4ZZZ’s feminist and women’s show Megaherzzz in 2011 - a show which covers news, opinions, interviews and music exclusively from women, transgender and non-binary identifying people. 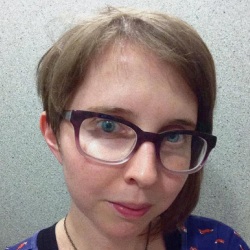 Rae has a career in publishing and design, creates podcasts for the 4ZZZ website, and has been part of organisation committees for SlutWalk and Reclaim the Night. Feminism for me is about intersectionality. While I believe it’s important to focus on women’s rights, that doesn’t mean to the exclusion of all other systems of oppression. I don’t think you can examine women’s rights and feminism without acknowledging and also examining the intersections with racism, homophobia, transphobia, ableism, classism, etc.